These systems purify water for general laboratory use or as a feed source for ultrapure systems. The 12 and 24 L/hr models use a diaphragm pump for quiet, efficient operation; the 6 L/hr model must be connected to an in-house line pressure. The built-in membrane protection system extends the life of the membrane. It includes a special cartridge that softens the water, and an automatic flush that removes scale build-up on the membrane. The control panel operates and monitors the main functions. Benefit from automatic operation with polythylene and fiberglass Thermo Scientific™ Barnstead™ RO Storage Reservoirs. 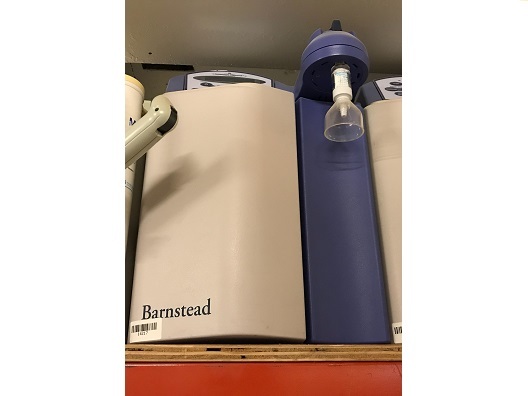 For use with Barnstead RO (Reverse Osmosis) water systems. Direct-Q systems deliver both pure and ultrapure water directly from tap for use with a wide variety of applications in your lab. Direct-Q systems can be equipped with integrated or external reservoirs and are designed for under bench-, bench- or wall-mounting. The system's built-in 185 nm UV lamp reduces the levels of organics for critical applications. You can fine-tune your ultrapure water quality to match your applications using Application specific point-of-use polishers to remove specific contaminants such as bacteria, particulates, pyrogen, nucleases, endocrine disruptors or volatile organic compounds. The system's versatile remote dispenser helps you stay focused on your work by providing ultrapure water delivery where you need it. The remote dispenser can be placed up to two meters from the Direct-Q system, and are available in free-standing or wall-mounted models. 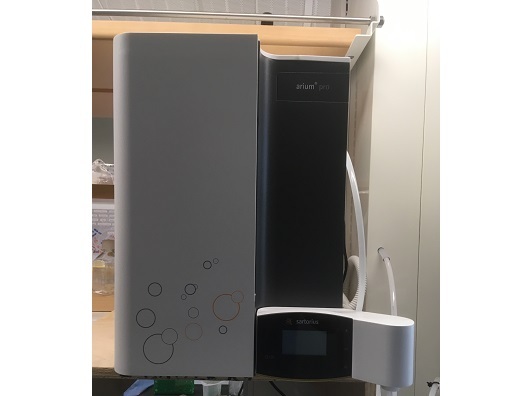 Description: The Thermo Scientific EASYpure II RF is a batch-fed water purification system designed to provide Type I reagent-grade water with extremely low organic carbon content. It uses a three-stage deionization process combined with a 0.2 micron final filter to polish pretreated water (distilled, deionized, or reverse osmosis) to produce water with a resistivity of up to 18.2 megohms-cm and with a total organic carbon content of less than 10 ppb. Water resistivity is continuously sensed by a resistivity cell and displayed on a digital display. The EASYpure II RF is designed to be a bench mounted unit. If wall mounting is required, contact Technical Services for information on a wall bracket and mounting accessory. Electrical Requirements: 100-240 VAC +5% -10%, 47-63 Hz. Flow Rate: Up to 1L/min. TOC: Maximum 5 ppb (this specification came from test conditions where a Milli-Q Gradient was fitted with a Q-Gard® 1 Purification Pack and a Quantum EX Ultrapure Cartridge and the feedwater came from a Millipore RiOs Water System. The feedwater TOC value was < 50 ppb). 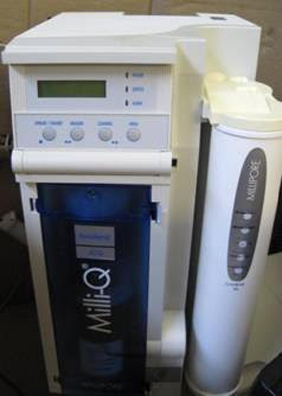 The TOC of the Milli-Q Product Water can vary as a function of the feedwater TOC. Milli-Q Gradient: Operating weight (wetted Q-Gard, Quantum and Millipak): 16 kg. Milli-Q Gradient A10: Operating weight: 16.8 kg. 120 VAC ± 10%, 50/60 Hz, 100 VA, 0.5 amp source, 2 amp Time Lag fuse used (ref. ZMQS6V0T1, MQP6V0T1, ZMQS6V001, ZMQP6V001). 230 VAC ± 10%, 50/60 Hz. 0.26 amp source, 1 amp Time Lag fuse used (ref. ZMQS5V0T1, ZMQP5V0T1, ZMQS5V001, ZMQP5V001). The source of electrical power should be within 1 meter of the Milli-Q. The source of electrical power must be earth grounded. 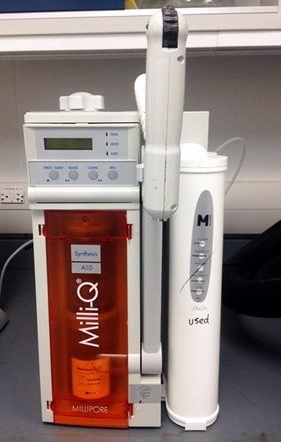 Description: The Millipore Milli-Q Plus water purification system purifies 1.5 L/min of ultrapure reagent grade water on demand. Alphanumeric display indicates operating status of system at all times. Produces 18.2 Megohm.cm resistivity; <10ppb TOC. An indicator light alerts you when the purification pack has to be exchanged. Filters, if present, are included AS IS (not tested or guaranteed). New cartridges can be ordered new from the manufacturer's supplier at extra cost. Feed Connector: polyamide tubing, 8 mm O.D. The model # 08971 is a water purification system designed to provide low TOC, high resistivity, reagent grade water that exceeds ASTM Type I, CAP and NCCLS Type I standards. It uses a fourstage deionization process combined with a UV oxidation and a 0.2 micron filter to polish suitable feed water (potable tap, distilled, deionized, or reverse osmosis) capable of producing low TOC (<1.0 ppb) water with a resistivity of up to 18.3 megohm-cm. Water resistivity is continuously monitored by a resistivity cell and displayed on a digital display.